Usually every 2 years. It was successfully restored every time. But it failed this time. Everything is well restored. Except a lot of mails in some folder are gone. Can I get those mails back? The backup file is .bak and file size is 885 MB. Did you encrypt the backup? What format do they use for the backup file? Mozbackup for example creates a *.pcv file but that is just a renamed *.zip file so you always have the option of renaming it to *.zip, expanding it using something like 7-Zip, and then importing the mail folders using the ImportExportTools add-on. See http://kb.mozillazine.org/Importing_folders for how to install and use that add-on. http://www.softsea.com/review/Backup-Thunderbird.html states there was only one release (Jul 19, 2013) of backup thunderbird and that its freeware. There doesn't seem to be any way to contact the author (http://www.backupthunderbird.com/feedback.html has no email address) or a support forum. All that I got from a WhoIs lookup of http://www.backupthunderbird.com is that the domain is registered using namecheap.com by WhoisGuard Protectedout, which is based in Panama. I noticed you also asked for help on https://support.mozilla.org/en-US/questions/1220438 . That's fine. But in the future please add a link in your MozillaZine post to anywhere else you also asked for help, so that somebody trying to help you can see if it has any useful information (such as replies you made to questions). What format do they use for the backup file? 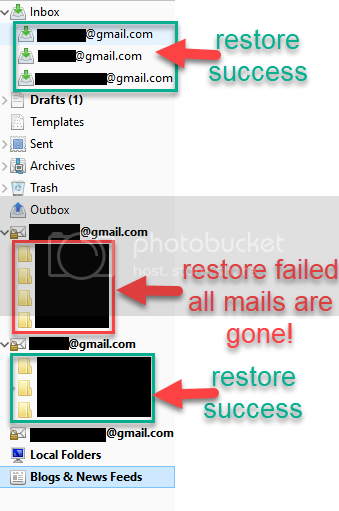 *I've attached a link picture to explain which folder is failed to restore. Luckily I've successfully restored on Windows7's PC. My main PC is Windows10. After successfully restored. I've try to backup again by both methods! But it failed the same as before to restore on Windows10's PC. So on Windows7's PC I have to move all mails that missing in Windows10's PC to unfailed folder. Then backup and restore again to Windows10's PC. This way I can see those mails that was missing. I really wonder why ? and what is the best proper way to backup and restore Thunderbird ? Because it's very long instruction. Those missing mails is in the folder that name in Thai character. So I have changed the folder name to English. That's it. Restore succesfully! Is this Mozilla Thunderbird bug? Also I've found the easiest way and easy to understand to backup the whole things in Thunderbird. I think this instruction is too long and not easy to understand. The youtube instructions are not about backing up and restoring, they're about moving the profile to a new PC. So you're comparing it against the wrong KB articles. The youtube instructions are very similar to whats described in http://kb.mozillazine.org/Move_to_a_new ... _Mozbackup (the Move to a new PC KB article) except they make some assumptions that the KB article doesn't. tanstaafl wrote: The youtube instructions are not about backing up and restoring, they're about moving the profile to a new PC. So you're comparing it against the wrong KB articles. The youtube instructions are very similar to whats described in http://kb.mozillazine.org/Move_to_a_new ... _Mozbackup (the Move to a new PC KB article) except they make some assumptions that the KB article doesn't. I see. sorry for the mistaken.